The transition into Autumn is a perfect time to stoke the inner fires of your creativity with this evening of Poetry & Movement. We will begin with Dancing (5 rhythms-esque) through to a Poetry Dive, which is a really simple and evocative way of experiencing poetry, followed by time to write and possibly share. Finally settling down to a sumptious Yoga Nidra to finish off. You don’t need to know, like or even particularly enjoy poetry to take part, this is a really delicious way of releasing your creativity through a cocktail of movement and words so if you feel intrigued, I encourage you to come along and give it a go. As part of my thrid year working with Kim Rosen, she asked me to create a Poetry based event and this is the result. It is donation based evening in aid of the SHE College Fund which helps young women at the VDay Safe House in Kenya (after fleeing FGM) go onto get a College Education. It’s great work and I am pleased to be able to support it in any small way that I can, but I can only do it with your help. So please come along and bring your friends! 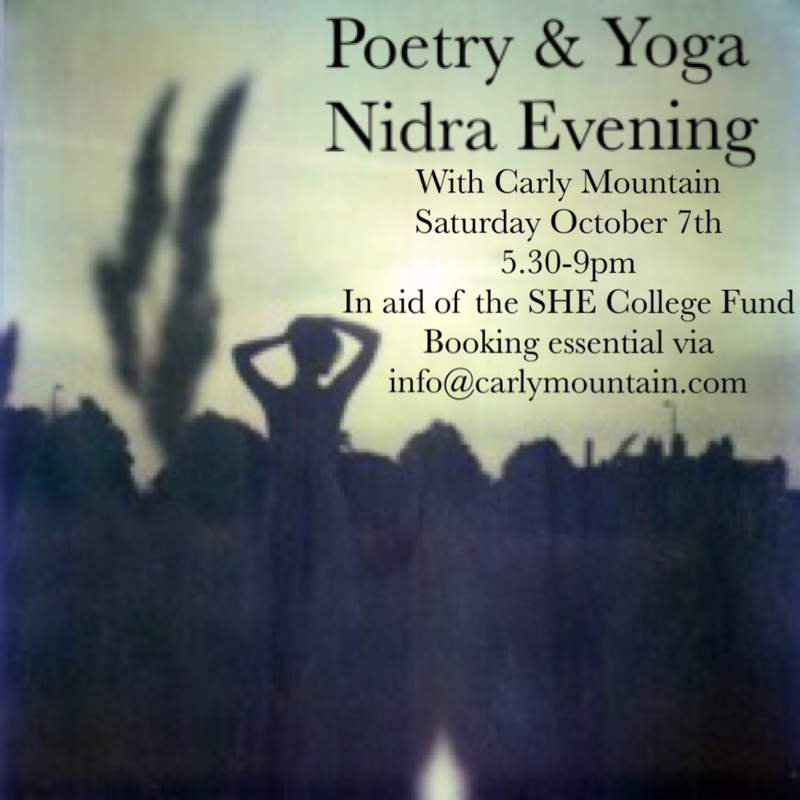 Booking essential please email info@carlymountain.com to book your space. Hope to see you there.